Enabling a Digital Life...: Imagine TV Will Be Missed…! NDTV Imagine, which later got rechristened to Imagine TV upon being bought by Turner from NDTV, has now drawn curtains on its business operations on 12th April 2012. The trade portals are flush with pieces on Imagine TV since Thursday 12th April 2012, when the news first broke out, with analysis from trade pundits to long and short editorials to reactions from the producers of the shows that were on-air on Imagine TV. What stake I have in this…well I’ll miss the relationship that I nurtured with Imagine, as a viewer and also for the business I did with the channel! When the channel was launched in Jan 2008, little did I know that my relationship with the channel will extend beyond being a viewer. Later in 2008 when I joined Reliance BIG Entertainment Private Limited – Division BIG Music, I was tasked with driving monetization of BIG Music catalogue vide licensing the tracks to TV Channels for synchronization in their various shows. 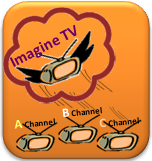 During this period I graduated from being a casual viewer to a viewer with a keen eye on the shows broadcast by Imagine, to come up with ideas on how the songs owned by BIG Music could be synchronized on these soaps/shows. Being a regular visitor with CDs of new song releases to Lotus Business Park, which was just a stone’s throw away from my Office in Maruti Chambers, Andheri (West), Mumbai became a routine. NDTV Imagine had its erstwhile office in Lotus Business Park prior to Turner taking it over. I still vividly remember the discussion I had with the head of Business Operation in the later part of 2008 regarding the licensing of the tracks from the film Rock On! for their upcoming show “Oye its Friday” which had Farhan Akhtar as it host. Music from Rock On! was quite a rage and I was very optimistic of the usage of the tracks from Rock On! in the show. As a music label our ask was on a higher side whereas being a Channel they were looking at the overall budget outlay they had for the show J but in the end, our tracks found good usage in the show. It was not only “Oye its Friday”, we got business from Imagine on other shows such as: Salaam E Comedy Awards, Karwachauth Ki Mehendi Layi Rang, Nachle Ve With Saroj Khan, Unforgettable Tour Mega Concert, Knights & Angels, Rakhi ka Swayamwar, Chaand Ke Paar Chalo, Idea Dhoom Macha De, etc. With Imagine no longer around, these are now nothing but memories in my head. Even as I read the points of view expressed by distinguished members of the trade on what went right or what went wrong with the Channel…my mind keeps rolling back to the days when I was a representative from a fledgling music label unlike more established ones with hundreds of hit songs under their belt and another thousands and millions in their catalog, Imagine gave us a patient hearing and encouraged us with repeat business. It really “Imagined” us!